The El Salvadorian Stars and Stripes with 9 stars had a square canton. It was adopted on 28th April 1865. The law described the canton as having as many stars as there are provinces, but we have no records about flags with eleven or thirteen stars (which would have been possible), but a postage stamp of 1867 shows the arms with eleven stars and one of 1879 with thirteen stars(!). With number of stars rising the canton became longer. The ensign had the coat of arms in the canton, but only on the obverse! On the reverse the stars were shown! So it happens that in the arms there are two flags. Sometimes the great coat of arms was shown, sometimes a lesser version, sometimes within a white circle sometimes directly on the red field. The official name of the state was "El Salvador" since 12 June 1824 but as the Magna Carta of 1824 wrote: "El Estado se denominar? Estado del Salvador. ", the name "Salvador" was used. From 1896 the name "El Salvador" was used on postage stamps, on coins it came in use in 1911, and a decree of 1915 prescribed the name "El Salvador" always to be written "...de El Salvador" and not "...del Salvador". Sources are El Salvadorian literature, official El Salvadorian Flag book. The evolution of the Salvador flag between 1865 and 1912 seems to be confuse. Anyway, Znamierowski 'solved' the problem by showing only the flag with 14 stars as 'Salvador, 1865-1912'. This is quite approximate because we know the adoption date of the flag with only 9 stars (28 April 1865) and the year of creation of the 14th province, 1877. While in Washington DC I was very lucky and found the official newspaper of the government of El Salvador from 1865 as well as the local Salvadoran newspaper from the same year. I found the following information in Spanish from both publications: "El Constitucional Periodico Oficial del Gobierno del jueves 4 de mayo de 1865" and "el diarrio El Faro del 8 de mayo de 1865". MINISTERIO DE RELACIONES EXTERIORES E INSTRUCCION PUBLICA. Decreto del Gobierno designando los colores del pabellon nacional y atributos del escudo de armas de la República. El Presidente de la República del Salvador. Cumplimentando el decreto del Cuerpo Legislativo de 14 de Febrero último que lo faculta para designar los colores del pabellon nacional y los atributos del escudo de armas, se ha servido decretar lo siguiente. Artículo 1o -- El pabellon nacional se compondrá de cinco fajas azules y cuatro blancas: el ancho de dichas fajas será de nueve pulgadas y su longitud de tres á cuatro varas castellanas. En el ángulo superior inmediato al asta, llevará un cuadro encarnado de una vara por lado, en el cual se colocarán nueve estrellas blancas de cinco ángulos salientes cada una, representando los nueve departamentos de la República. Art. 2o -- La bandera antedicha será la mercante. La de guerra tendrá los mismos colores y dimensiones y en el cuadro encarnado de que se ha hecho mencion, tendrá el escudo de armas de la República, llevando al reverso las nueve estrellas de los departamentos. Art. 3o -- El escudo de armas nacional será el mismo de la antigua federacion centro americana con las modificaciones siguientes: 1a. en lugar de los cinco volcanes que representaban los cinco Estados de la federacion habrá solamente uno en actividad imitando al Izalco: 2a. en el espacio superiro del cuadro que debe contener este volcan se colocarán las mismas nueve estrellas formando semicírculo: 3a. en la base del escudo aparecerá de un lado y otro el nuevo pabellon de la República: 4a. el gorro de la libertad descansará en la parte en que se unen los cuernos de la abundancia que descienden por ambos lados cuadro: 5a. en forma de semicírculo, se leerá entre rayos luminosos: 15 de Setiembre de 1821, quedando el gorro en el centro de éste: y 6a. limitará el escudo una franja circular en cuya circunferencia aparecerá esta leyenda: República del Salvador en la América Central. Art. 4o -- El Ministro de Relaciones se encargará del cumplimiento y publicacion de este decreto. El Ministro de Relaciones Exteriores é Instruccion Pública: Gregorio Arbizú. Article 1 - The national flag will consist of five blue stripes and four white ones: the width of each stripe will be nine inches and its length would be of 3 or 4 varas castellanas (one vara castellana equals 36 inches) . In the upper corner next to the flag pole, there will be a red square of one vara (36 inches) per side, placing nine white five pointed stars, representing the nine departments of the republic. So this clears the doubt about the size of the flag and its components. The red square remained a square as stars were added, according to the law of 1898 that describes the flag of the Republica Mayor de Centroamerica and the one from 1912 they both mentioned that they will substitute the flag of the 9 stripes with the red square and 14 stars. Here is a photo of a flag with 14 stars used during independence at the celebrations at the beginning of the century. Also here are images of 9, 11, 12, 13, 14 star flags and also the national ensign and its variant . According to the law decree that I found , they gave two official sizes that could be used for the flag. For the 1877 flag the one that was officially used in public events as shown on the picture taken at the park, but there was another version that I have seen used on books and a flag that I have from the period. On the flags with the coat of arms (National Ensigns), the decree specifies that the whole coat of arms will be placed on the flag, but on stamps and coins of the period they show sometimes the use of the whole coat of arms on a white circle or just part of the coat of arms. 1. What was used between 1821-1865? I understand that BWB triband was used, or was it? The historical outline is quite complicated for these years, Salvador being part of the kingdom of Guatemala and this at times federal part of Mexico, one declaring independence from the other at times... What was used before 1821, anyway? 2. The 1865 flag is well documented with the legislative documents, however, I think that the image might be discussed. Namely, the Article 1 of the legislation give detailed construction sheet: 7 stripes of 9" wide, square canton of 1 v.c. (=36") and length of stripes 3 or 4 v.c. This last is, in my interpretation the description of length of top four stripes being 3 v.c. and lower 5 stripes of 4 v.c. being longer for the width of the canton. Fred Drews interpret this as two possibilities for the overall ratio, which is not correct, I think. If I am correct that the overall flag size is 81"x144", i.e. the ratio is 9:16. (and 63"x108" flag is inexistent). Of course, Fred might have other reasons for believing there was 3v.c. long flag of which I am unaware. Ralf Stelter writes that the ensign had different reverse from the obverse, namely while on he obverse there was the Coat of Arms in the canton, on the reverse there was stars as in the national flag. This is almost un-noticeable and it might be good to point it better by placing reverse images next to the obverse by each of the ensigns. 3. Finally, the stars and stripes flag was abandoned in 1912. Why, what happened then? Just a "whim"/"nostalgia"? There must have been some political background. Anyhow, we claim (as does Smith) that the current BWB triband was adopted in 1972. That means that we have 60 years of kind of void. Can anyone fill it in? If the changes in 1972 legislation are no more then further elaboration of earlier design, there is not much sense in quoting it as the adoption date. Wouldn't something of the sort be better: "Adopted in 1821, abandoned 1865. Reintroduced 1912, last legislation 27 Sep. 1972." ? "The national flag, also navy flag, was used from 1838 till 1865, and later from 1912 on. Till 1972 it had the unusual proportions of 189:335; that was changed to 3x5. 15 Sep 1912 El Salvador readopted the Coat of Arms, which had been used 1851-1858, which reminded of the old attempt at federation." In 1912 the president of El Salvador, General Tomas Regalado, declared that he was willing to obey the Constitution, and in so doing he had (the first) free elections held in 1913. I suppose that that important resolution also prompted the change in symbols. Source: "Survol Historique des Pays d'Amérique Latine", by Francis V. Féraud, 1959. Jarig wrote: "Till 1972 it had the unusual proportions of 189:335" - Not according to the Decree of 1972 (see here) it wasn't. Article 7 says "The great flag [la bandera magna] will be three meters and 35 centimetres in length by one meter and 89 centimetres in width, on which will be paced the coat of arms with all its accoutrements...". I do not have a copy of the Decree of 1912 or of 1916 (which apparently modified it), so have no way of knowing whether the unusual proportions were carried over from the previous legislation or were entirely new. Either way, unless there are supplementary regulations of a later date the ratio of 189:335 stands (at least for the largest size of official flag). There was no state or republic of El Salvador before 1824. There only was San Salvador and the struggle to unite all of Central America as a force against Mexico. On 11 January 1822 the authority of San Salvador and San Vincente declared their total independence from Mexico and Spain. Santa Ana and Sonsonate did not join, but declared themselves parts of Mexico. On 20 February 1822 Salvador adopted the "celeste-blanco-celeste" flag, when soldiers were sworn in for the fight for independence against Mexico. They adopted the colours of Belgrano and San Martin, who have been successful in South America. On 1 July 1823 the independence of the United Provinces of Central America was declared. On 13 November 1823 the "Alcadia mayor de Sonsonate" and the "Intendencia de San Salvador" united for a "indivisible unit", in effect on 22 December. On 7 February 1824 Ahuachapán separated from the former province of Sonsonate and joined San Salvador. On 5 march 1824 delegates from Sonsonate and San Salvador met, on 12 June they published the constitution of "El Salvador", "a federal state within the union". These facts show that El Salvador was not a founder member of the federation, but only grew together during te first year. So the question is not "which flag was used by El Salvador before 1822 (!)?" - El Salvador wasn't created before 1824. The question should be "which flags were flown in those parts which later united to El Salvador?" Before 1821 the Spanish flag must have been used. The independence declaration of Guatemala was sealed with the Spanish seal! Salvador declared her own independence, as they did not want to become a part of neither Guatemala nor Mexico. I think they had no flag, as they adopted their first flag, celeste-blanco-celeste, when they prepared for war against Mexico. As to the current flag - Adopted 1822 (not 1821! ), minor modifications 1841, abandoned 1865. Reintroduced with minor modifications in 1912, slightly modified in 1916, last legislation or confirmation 1972. There are no 60 years of kind of void. Salvadorian literature tells that Salvadorenos were proud of their flag and so they kept it (the federal flag in fact was the flag of Salvador and not vice versa). In 1841 the coat of arms was slightly modified. The idea of a new federation was still in the Salvadorians' head. In a law of 30 January 1841, Salvador declares her independence as "Republica del Salvador", the constitution of 22 February 1841 again says "Estado"! In 1842 Slavador becomes a member of the "Confederacion Centroamericana" with a constitution of 17 july 1842. This lose confederation lasts until 1845. In 1849 the "Federacion de Centroamerica" is founded, which renames "Republica de Centroamerica" in 1852. In 1859 Salvador "throws away" the federal idea and names herself "Republica de El Salvador". To underline her withdrawal El Salvador adopts a new flag in 1865. Historians write "the first flag since the federal flag, as El Salvador used to use the federal flag until that year" (this still clears nothing: was it a federal flag with own arms or federal arms? - same historians write that in 1841 the coat of arms was slightly modified...) In 1912 the flag of today was adopted. Decree of 17 may 1912, published on 30 may and nationwide hoisted for the first time on 15 September 1912. President D. Aranjio had initiated the return of the flag. The flags in use were a national flag (plain), a national flag at sea (silver letters DIONS UNION LIBERTAD), state flag on land and at sea (same with gold letters), a flag for the Diplomatic Corps and their ships (coat of arms in the center). Official dimensions of the flag: 3.35 x 1.89 m, other dimensions may be used as long as the stripes are equal and of the same colour. The law about the coat of arms is of the same day but was modified by decree of 20 may 1916. The law described a coat of arms which was similar to the one of Nicaragua with different inscription. The later decree added flags and wreath, to differentiate it from the Nicaraguan Coat of Arms. In 1972 the use of the flags was changed slightly. Guatemala which belonged to the Virreinato of Mexico was called Capitanía General de Guatemala and this was divided in several Intendencias all the way to the Panama border (now Costa Rica). Being the first one, San Salvador was created by the King Carlos III on September 17, 1785. Each intendencia had its own intendente (governor) who took oath under the king and the limits were created then for San Salvador: this included San Miguel, San Vicente and San Salvador which included also Gran Santa Ana. Only what is was called the Alcaldia mayor of Sonsonate and Ahuachapan were part of Guatemala, this two became part of San Salvador in November 1823 to form the current limits of present El Salvador. In 1808 the king promulgates a coat of arms for the intendencia of San Salvador. which is used on offices and official correspondence of the intendencia and minted in coins. On January 11, 1822 the Intendencia of San Salvador segregates itself from Guatemala which had joined the Mexican Empire. On June 12 1824 La intendencia of San Salvador writes its first constitution and changes its name to Estado del Salvador. The Spanish flag with the coat of arms of the period was the flag that flew at the time untill 1821. After independence on September 15, 1821 the flag that flew was still the Spanish flag but all the emblems and coat of arms were removed. Then the flag of the Mexican empire flew in certain parts of the intendencia and the new adopted light blue white light blue was flown from February 1922. The blue white blue flag was flown untill 1865 changing only the coat of arms in different occasions. And the Dios Union Libertad flag also flew at this time. In 1898 for 20 days the blue white blue flag was reinstated and raised Nov 2 with the coat of arms of the Republica mayor de centroamerica, then went back to the 1865 flag until 1912. In 1911 the president Manuel Enrique Araujo celebrated on November 11, 1911 the centenary of the first independence movement that proclaimed independence in San Salvador until it got suppressed at that time. 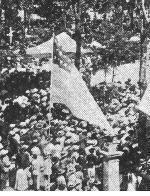 Araujo then he started the movement to go back to the original flag and in may 1912 the Assembly voted to have it reinstated, being raised officially on September 15, 1912 by the president. The 1912 law specifies its colors, use and size. In 1916 there were modifications made to the law concerning the coat of arms. as well as in 1932. The 1970 law also altered slightly the Coat of Arms removing the red star. And adds to the current size specified in the 1912 law new sizes for the flag to be used on buildings, offices and parades. The previous flag of El Salvador (official name), was in effect from 1865 to 1912. It started with only 9 stars positioned in rows of 3, 3, 3 in the red canton. Concerning the 1865 flag, Ralf Stelter's introduction clearly states that the flag canton was square, although the preview is a bit ambiguous. The names of the nine departments once represented in the canton were: "San Salvador, Santa Ana, San Miguel, Sonsonate, San Vicente, La Paz, La Libertad, Chalatenango (and) Cuscatlán". At the time there was in use another flag (the national ensign), that instead of having the stars in the canton, it had the coat of arms of that period. 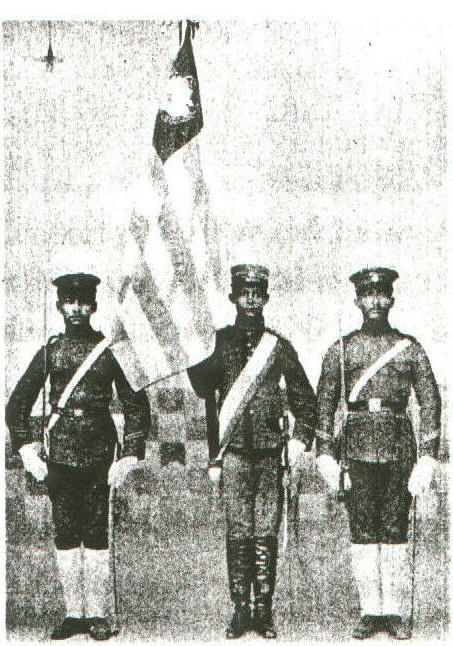 In a photo taken in 1911, there is the flag used by the military during a parade. The flag shows the red square with the national coat of arms placed directly on the red and not in a white circle. Based on image provided by Fred Drews. I found this flag in a very old encyclopedia, it is part of the Coat-of-Arms of El Salvador and it's displayed on the right side of the Coat, on the left side there's another flag (this one already mentioned above). The 'National ensign' is not an alternative ensign but the reverse of the national flag, obverse and reverse of the flag being placed on either side of the coat of arms according to Ralf's introduction. I suspect the image should have a proportion of 1:2 like all of the other flags of that period but I have no solid evidence for it. By 1869, 3 more departments were added (2 in June, 1865, and one in February, 1869) increasing then the number of stars to 12, positioned in rows of 4, 4, 4 in the red canton. By 1877, 2 more departments were added (one in February, 1873, and one in February, 1877) increasing then the number of stars to 14, positioned in rows of 4,3,4,3 in the red canton. The flag is from1875. A variant of the 4, 3, 4, 3 pattern used a pattern of 5, 4, 5, as shown by Andrees Handatlas of 1921 (7. Auflage). Jarig Bakker, 15 January 1999. The 1877 flag, with 14 stars in canton, is shown by Znamierowski [zna00) with proportion 1:2. The proportion seems also to be 1:2 on the preview of the 1877 coat of arms below. "Album des pavillons nationaux et des marques distinctives des marines de guerre et de commerce" (1889) shows the pilot flag of El Salvador with the same design as the canton of the national flag adopted in 1877. The arms of the period were: a shield containing a volcano in the middle surrounded by water and on the left side of the shield the previous flag discussed, and on the right side the same flag but with the coat of arms in the red canton (I will send a gif of one in the future). The red canton has a depth of 5 stripes. I decided to create the coat of arms exactly as they were during the period. I took post stamps, tax stamps, coins and post cards of the late 1800s and beginning of the 1900s. All had the same emblem on them so I created the following coat of arms from them, which follows the exact description of the law. In XIX century the Indians revolted against conscription and proclaimed their leader Aquino as king. Kingdom occupied a part of El Salvador. The full history was published in issue 1 of Flag Report.